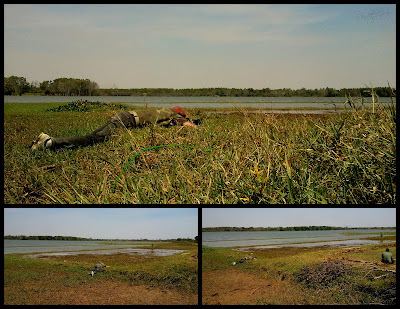 This time our weekend birding destination was Kaikondanahalli Lake (also referred as Kaikondrahalli Lake or KK Halli Lake). This is on the Sarjapur Road, Near the Total Mall. I have gone passed that lake lot of times. But never paused to have a walk around the lake, as i thought its not a that-good-lake to spend time. My memory, prior to this visit, dates back to the time, when this lake was just another bangalore lake, used as a sewage storage place or a dry dry ground. So, when we (Parikshit) decided on this lake, i did not have any expectations of good sightings of birds around that area. But when we reached that place, all my thoughts changed instantly. Thanks to the people living near that lake, whose initiative, along with the BBMP, various environmentalists & other volunteer organizations, because of whom, the situation there has improved a LOT !!!!! (you can read more @ http://www.uwbengaluru.org/kaikondanahalli-lake-update ). We had really good sightings of birds and also could spend lot of time there (not a picnic spot though). we can see lot of people jogging around the lake in the morning, also groups of photographers (like us) trying to get the pictures. Some of the pictures which i like because of the composition..
Our Team this time : Parikshit (Parry), Aditya & Albin. Thanks to the Team !!!!!! It was really a amazing trip.. Seriously I didn't expect so many birds at that location even after my friend told me so.. A truly commendable initiative by the folks near Sarjarpur to get this Lake cleaned up..